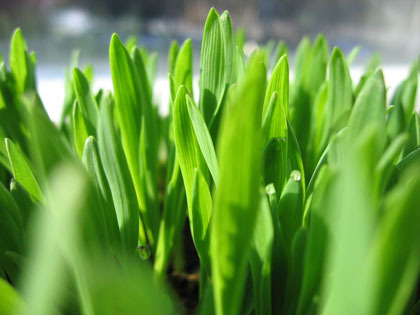 Organic lawn care and gardening begins with a commitment to the environment. Habitat fragmentation is occurring all over the United States, especially around cities, and even in farming communities. Discontinuous land use breaks up large blocks of habitat such as forests, grasslands, and marshes. Subdivisions, roads and fences are being built at a fast rate. The survival of many plants and animals are threatened. Exotic plants have escaped into the wild, threatening native species. Introduced insects such as the imported fire ant have altered entire ecosystems by preying on native microbes, insects, and the young of small animals. A more organic approach to landscape design and gardening is in order. It is no longer a fad! Private residences and other developed properties hold a great potential for restoring quality, quantity, and richness of the plant and wildlife habitat that has been displaced. 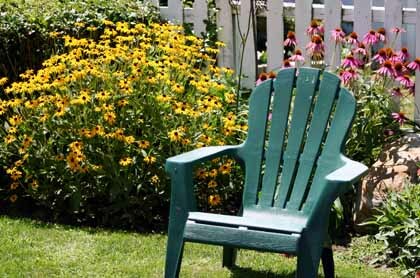 By maintaining a healthy habitat in our yards, we create healthier living. Plants in richly vegetated spaces absorb carbon dioxide and give off oxygen, thus renewing our air supply. Plant foliage captures dust and other pollutants, purifying the air we breathe. Vegetated areas aid in erosion and soil conservation. Plant roots hold soils in place, while plants impede water runoff. A diverse landscape containing many species of plants not only supports an abundance of wildlife, it is also less prone to large scale devastation from insect pests or diseases. Need a mower? Visit Clean Air Gardening for reel mowers and electric lawnmowers.